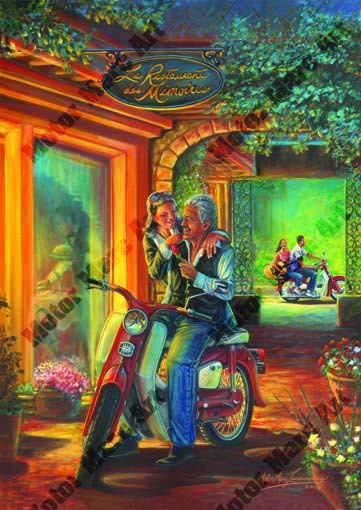 Media Size Choose an option16" x 24"20" x 30"
A dinner date on a motorcycle is still cool after all these years and the memories come flooding back in this nostalgic piece that tells a story of love and companionship. This painting touches the heart and brings back memories of romance. The riders in the back ground provide a look back in time. “I Met the Nicest Person” is the first title in the series and a must have for enthusiasts. NEW RELEASE: Honda’s ® 50th Anniversary / 2008. The first painting of the series. A limited quantity on high quality canvas is sure to be a valuable addition to any collection. Reserve your prints, low numbers available. 16" x 24", 20" x 30"